It is recommended that you bind the edges of your canvas with Masking tape before you begin stitching. This will prevent the canvas from unraveling and from catching the threads as you stitch. Simply cut a piece of tape the length of one side of the canvas. Apply the tape over the canvas edge, with half of the tape on the front side and half on the back side. Repeat on all four sides of the canvas. If you plan to use a frame, mount the prepared canvas to your frame of choice. 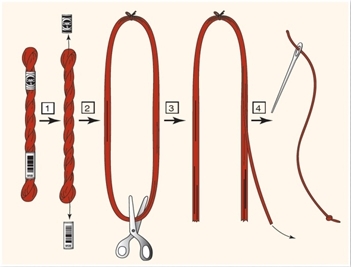 Learn how to separate your thread strands so you can adjust the thickness of your thread. DMC Mouline Stranded Cotton is a 6 stranded thread. 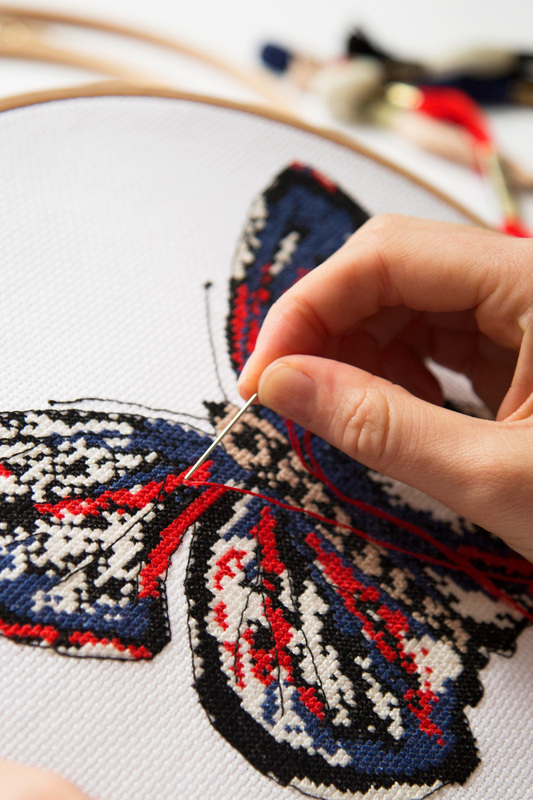 You will usually not stitch with all 6 strands of thread so you will have to separate the thread before stitching. To start, find the end of the thread on your skein of DMC thread. Slowly pull the end out from the skein until you have an 45cm (18”) length of thread and cut it off. To separate the thread into individual strands, pull one strand up and out slowly until it is completely separated from the remaining strands. Continue to pull out the number of strands you need to stitch with. To rejoin the threads, hold them together at one end then gently stroke the lengths to smooth and recombine them. If you are using Pearl Cotton There are two common ways to open and cut a skein of Pearl Cotton, depending on the length of thread you prefer or need. For approximately 50cm (19”) lengths of thread: Push the two labels toward the centre. Find the end with the two loops and cut through the bottom of each loop. Move the labels back into place. Pick and pull out a single piece of thread from the top loop. 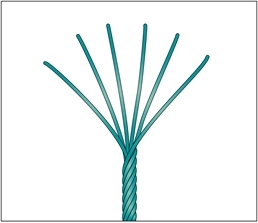 For approximately 100cm (38”) lengths of thread: Remove both labels and untwist skein to form an oval. Cut through all the threads at one end of the oval. Pick and remove one thread for use as needed. To keep the threads tidy for future use, put the colour number label back onto the threads and slide it to the centre. Fold the threads in half and set aside. TIP: Pearl Cotton is commonly stitched using one full strand for embroideries and is not doubled up to make a thicker thread. If you want a heavier thread for your stitching choose a Pearl Cotton 3 or a size 5. 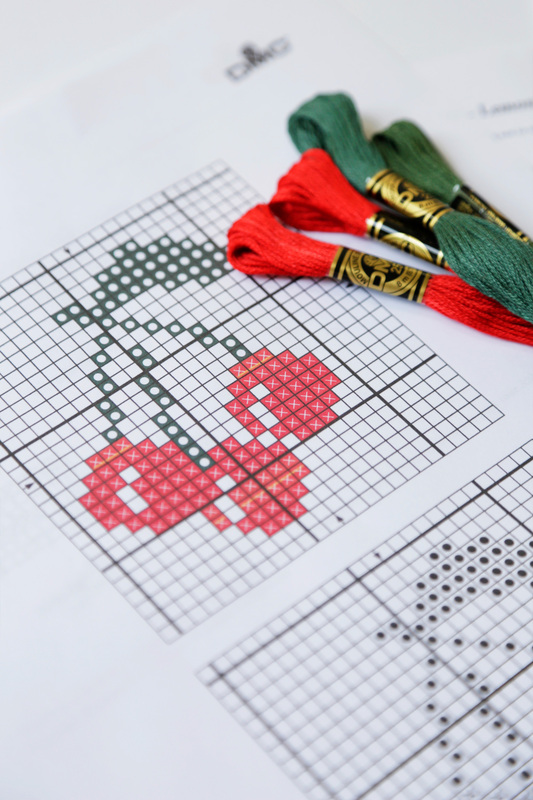 If you are working a delicate stitch or using a light weight fabric, use a Pearl Cotton 12 or a size 8 for your embroidery. To thread your needle it is easiest to use the DMC Needle Threader. To use the DMC Needle Threader, slide the eye of the needle onto the hook, then loop the thread on the hook and pass the hook through the eye of the needle and pull the thread through. Pinch and Poke – Cut a clean end of thread and pinch it between your thumb and forefinger, leaving only a little of the end exposed. Holding the needle in your other hand, “poke” the eye of the needle over the tip and the thread into the eye, then pull the thread through. Pinching the thread gives you more control to guide the thread into the eye. You may have to “saw” the eye of the needle back and forth slightly to get the thread to enter the eye. Loop, Pinch and Press – Loop the end of thread over the eye of the needle and pinch the loop tightly between your thumb and forefinger. Remove the needle from the loop and press the eye of the needle down over the thread. Pull on the loop to get the thread through the eye of the needle. TIP: Make sure your hands and work surface are kept clean while you’re stitching. Make it a habit to wash your hands before you begin to stitch and keep drinks and snacks away from the area.